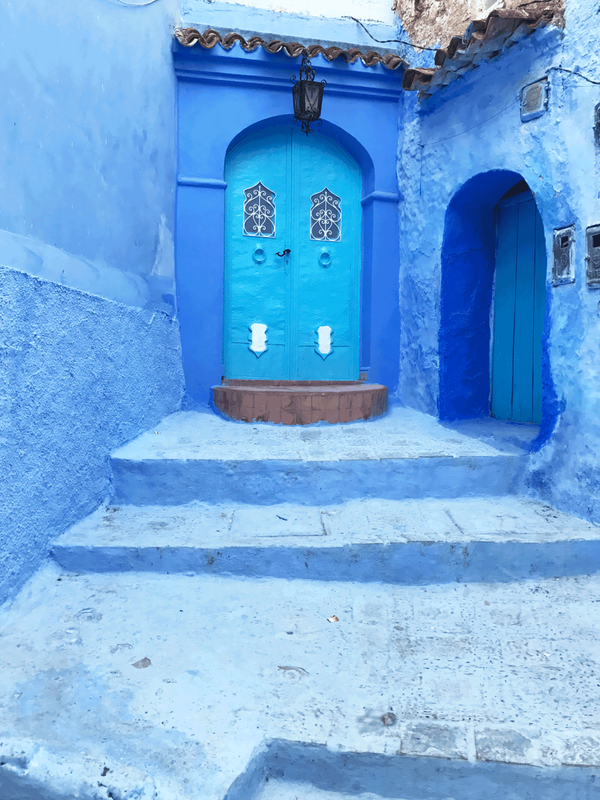 Chefchaouen, Morocco: 42 Pictures That Will Make You Want To Book A Trip to the Blue City — Sapphire & Elm Travel Co.
You might not recognize the name Chefchaouen, but chances are you've seen one of the many iconic images of Morocco's blue city. 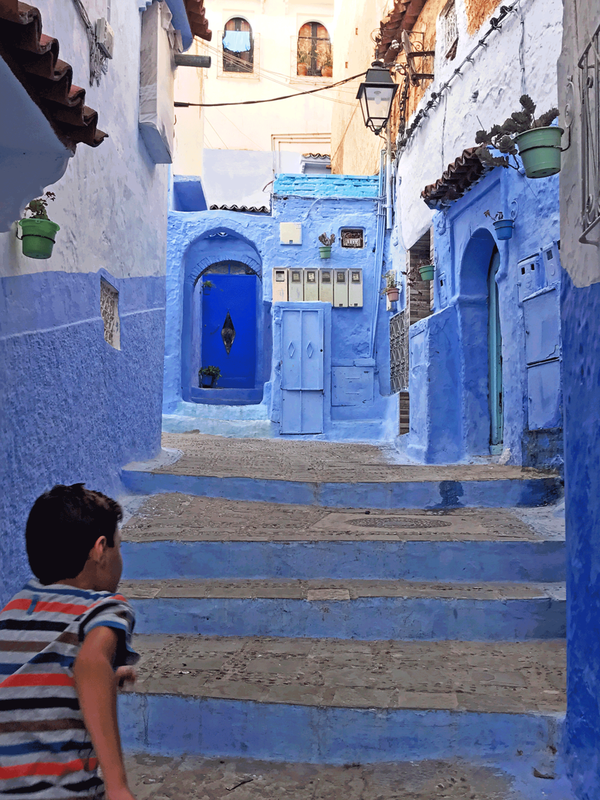 One of Morocco’s best kept secrets is a village draped in “sea” of blue; blue walls, blue tiles, blue doors, blue flower pots and blue skies. A striking city in delightful various shades of blue. Chefchaouen, also called the Blue Pearl, is a unique city and equal parts whimsical and posh located in north eastern Morocco. Here you’ll find traditional heavy doors with metal accents, but also doors seemingly fit for hobbits and wait, are those polka dot stairs! There are extravagant lanterns accidentally splattered with paint, vines strung across alleyways and rugs for sale that are slung against walls. This vivid city is nothing short of charming. Chefchaouen, or Chaouen as it’s often called by Moroccans, is a small city with a population of roughly 45,000 people. It has been relatively unknown until the last few years when photos started emerging of this monochromatic city. Chefchaouen was established in 1471 when Moorish and Jewish people fled here to escape the Reconquista of Spain. Today, in addition to descendants of the original Moors and Jews, the city is inhabited by the Berber people and Muslims, all of whom live in harmony. There are several speculations for why the city is painted blue. The two most common I heard were that the Jews painted it to symbolize heaven, and the color acts as mosquito repellent. Either way, the tradition has stuck; the town gets an annual fresh coat of blue paint. Chefchaouen is a gem, an unintentionally popular city that showcases the impressive diversity that Morocco has to offer. For example, did you know there’s a town in Morocco where it mountains are snow peaked year round? Or that there is an area where you can find some amazing canyoneering in what feels like a jungle? Yes, in the same small desert country known for the iconic Sahara Desert? My time in Chefchaouen was short but quite peaceful. Upon arrival I walked around the medina (the old Arab quarter), eager to see if the pictures accurately represented this cities charm, or if it was just the same few streets that were circulating over the web. After less than I hour I knew it to be true, that this city was truly something spectacular. I hadn’t realized it was in the mountains, and the stark contrast between hard mountain peaks and desert cliffs to this soft, serene town is mesmerizing. This city is not ideal for shopping as the medina is much smaller than other Moroccan counterparts like Marrakesh, Fez, Casablanca and Tangier. However, as it’s much more relaxed than those cities mentioned, it could also prove to be a more enjoyable, more hassle-free buying experience. Although I was still called to buy things from ever vendor I walked by. In addition to wandering the now iconic blue medina, there are many other things you can do in and around the area. For example, get a hammam (a traditional Moroccan bath), go canyoneering around Akchour, hike up to the Mosque, and much more. Note: Kif or hash, is a prominent crop in the region. It’s said the Morocco produces yearly half of the world’s hashish. Although you can find tours to farm, know that kif is illegal in the country. It is possible the guide gets arrested, although the charges are almost exclusively for not having proper tour guide license instead of marijuana related activities. Chefchaouen offers a thousand photo opportunities of both quiet corners and typical busy medina streets. A few hours of wandering aimlessly around the medina, soaking up the scenery, and snapping pictures of the most picturesque places and I was ready to move on to the city of Fez. Want to see the magic of the blue city of Morocco? Contact us to start planning your custom trip to Chefchaouen, Morocco and beyond.